There is not much metal in the photo sessions of the band. I mention this because in their music there is something as if coming from a college of the state administration. NWOUSHM influences in the style of LAMB OF GOD are melted with an old EMO-feeling of lament (Who could believe it before? ), and with some LIMP BISKIT rapping. At moments the vocal line is becoming softer and This or the Apocalypse sound in the frames of post-metal as NICKELBACK. The producing put serious bridles to each tide of aggression of the band. And it seems that the members of the band have no energy for protest. The artwork also is remarkably tamed. It reflects in a proper way the approach of the album. The parents would not be embarrassed if their children listen to This or the Apocalypse. Although there could be heard some energy and frankness in the songs, they sound as a swearing of the British Queen. The European bonus track is one idea heavier and faster. The riff is more thrash and the aggression is let outside. At the same time it reminds the songs from the first album of the band. 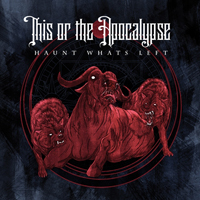 This or the Apocalypse are tamed conventional extremism with their own face and perfect sound.